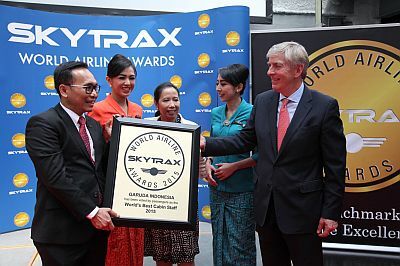 LE BOURGET, FRANCE, June 16, 2015 - (ACN Newswire) - In line with Garuda Indonesia's continuous service enhancement program, Garuda Indonesia's cabin crew again was voted "The World's Best Cabin Crew 2015" by Skytrax - a London-based, independent airline ranking agency. The award is the second consequtive year it has been won by Garuda Indonesia after previously in 2014, it won the same title, beating other leading world airlines. "The World's Best Cabin Crew 2015" award was presented on Tuesday, June 16, 2015 during the "The World Airline Awards 2015" and took place during the "Paris Airshow 2015" in Paris, France. The award was presented by the CEO of Skytrax, Edward Plaisted to Garuda Indonesia's President and CEO, M. Arif Wibowo. "The World's Best Cabin Crew 2015" award was given to Garuda Indonesia based on a global customer satisfaction survey" conducted by Skytrax of more than 18 million passengers. The survey, which covers 245 international airlines, is held every year and measures standards across 41 key performance indicators of airline products and services. Commenting on this honor, Garuda Indonesia President and CEO, M. Arif Wibowo expressed his delight with Garuda Indonesia's most recent achievement, "The World's Best Cabin Crew 2015" award. Garuda Indonesia's success in winning the "The World's Best Cabin Crew" title once more in 2015 reflects the tireless hard work and deep commitment from everyone at Garuda Indonesia, in particular our cabin crew, to deliver service of the highest standard to our passengers. We would also like to thank our loyal passengers for continuing to support Garuda Indonesia hence enabling us to win the trust and "The World's Best Cabin Crew" award for the second consecutive year," said Arif. By offering our unique "Garuda Indonesia Experience" service concept that emphasizes warm Indonesian hospitality and the best aspects of our cultural heritage, we are confident that Garuda Indonesia will continue to be ranked among the world's best in the years to come," added Arif. Spurred on by a strong commitment from the management and employees of Garuda Indonesia to deliver the best service, Garuda Indonesia's performance continues to earn global recognition. During the "Farnborough Airshow 2012" in London, Garuda was voted "The World's Best Regional Airline". During the "Paris Air Show 2013" held in June 2013, Garuda Indonesia was named "The World's Best Economy Class" by Skytrax, and in 2014 Garuda Indonesia also won the title of "5-Star Airline" from Skytrax. Currently, Garuda Indonesia ranks seventh in the list of "The World's Best Airlines". Through a continuous business transformation program, which focuses especially on fleet development, Garuda Indonesia will operate as many as 185 aircraft by the end of 2015 (including its subsidiary, Citilink). Since becoming a member of the global airline alliance SkyTeam in March 2014, Garuda Indonesia, together with 19 other SkyTeam members, provides access to an extensive global network with over 16,323 daily flights to 1,052 destinations in 177 countries. In addition, Garuda Indonesia passengers can also enjoy 629 lounges of other SkyTeam member airlines, worldwide.